The muscled figure of Technoviking is a significant part of the 21st century history of the Internet, you have seen him probably a thousand times, and you may wonder why only his blackened shape can be seen in the animated gif above. Here is why. 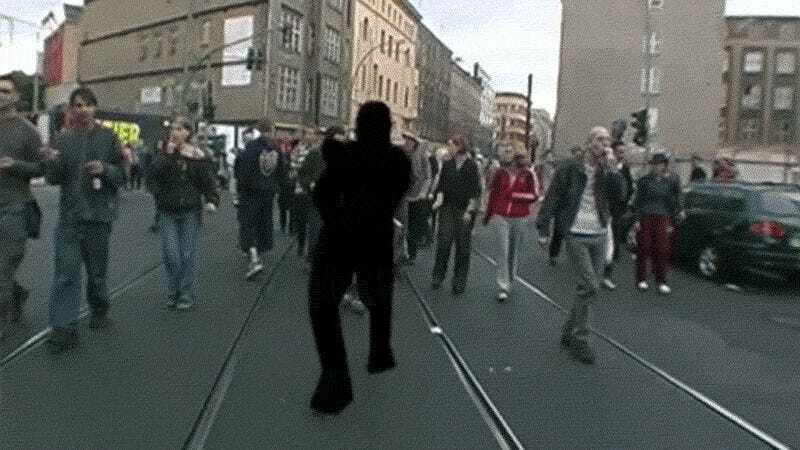 The unknown German who was filmed in Berlin at the 2000 Fuckparade became an Internet sensation in 2006 and is still one of the best known memes of our age spawning newer and newer fan made viral images and videos and pieces of art and merchandise products. And because he is a deliberate but merciless viking, after 12 years he successfully sued Matthias Fritsch, the cameraman who recorded his iconic actions, gestures and dance moves. After the lost trial, Fritsch, who previously earned about $11,000 from millions of You Tube views and sold T-Shirts but faced a punishment of up to $285,000 started a crowdfunding campaign in order to make a movie about this extremely interesting case of Internet, culture, rights and laws. Now, finally here is the documentary (a shorter 50 minute version, censored for reasons) of the struggle for personality rights versus copy rights, showing all stations of the unintended creation of a god-like social media phenomenon.